New York dominates K-12 Nationals! New York has been the “Mecca” of U.S. chess for decades. Famous as the childhood home of Bobby Fischer and for its famed chess clubs and parks, the tradition continues in scholastic chess. Hikaru Nakamura found fame in the scholastic arena not long ago and they may have a few more GMs coming through the pipeline. I believe this is a first. While some K-12 schools have won three sections in the past, I don’t think anyone has taken 100% of the sections for which they are eligible. The sixth graders (led by Shawn Swindell) went 6-0 in the last two rounds to beat out Hunter and Horace Mann by a point and a half. The top three scores in each grade count towards to the team total. The seventh graders (led by Myles Foster) had a very significant two-point lead going into the last round (with two 4½’s and a huge “cushion” of six 4’s.). They ended up beating Hunter by half a point and Horace Mann by 3½ points. 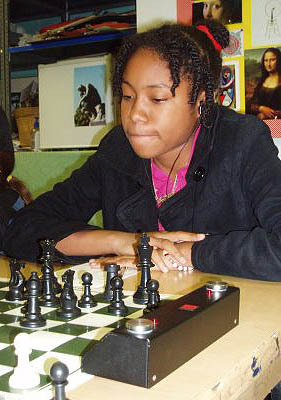 The eighth graders (led by Rochelle Ballantyne, who drew the top seeded player (2052) in the last round with black) tied with Horace Mann. New York Times ran an article on the success of the local schools and mentioned that P.S. 116 won the 1st-grade championship; Hunter Elementary won the 2nd grade championship; Horace Mann won both the 4th- and 5th-grade championships; I.S. 318 swept the 6th-8th grades. Josh Colas starred for New York’s Mamaroneck Avenue School and scored 6/7 in the 5th grade section. Mamaroneck came in 2nd behind Horace Mann followed by four more New York schools. The sixth section saw New York take the top nine positions! Kudos to all the New York scholastics players and coaches! There are some photos and positions from the kids’ games up at http://lizzyknowsall.blogspot.com/2008/12/student-tactics-quiz-positions.html. I like these puzzles. Very instructive! For #1, 1…Qxf6??? tosses a piece after 2.Nxe6! For #4, I quickly looked at 1.Nxb7 Rxb7 2.Rc7! Not sure if that is the solution, but looks good! For #6, 1.b4! is cute. I’ll leave the rest… very practical examples! For John Paul Garcia’s, I didn’t know whether to look for the right move or the one he chose (the funniest). I forgot. There is an interview with Rochelle Ballantyne with the ICC’s Macauley Peterson.